There's nothing new I can say about this card that hasn't already been said. We won it off eBay for a buck ( free shipping! ). I'm guessing that Mr. Giuliani probably doesn't sign this card so I guess we'll just have to hold onto it as it is. Now I guess I have to hunt down the elusive red version. 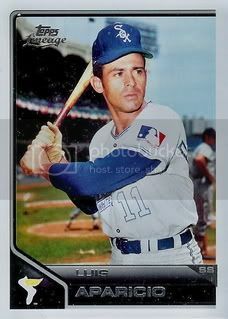 Since we added the Luis Aparicio Player Collection to the blog, I've become more interested in non-autographed cards of Lil Luis too. I've never seen this insert set before. It seems like Donruss/Playoff made a ton of sets during the middle part of the last decade so I'm not too surprised I wasn't familiar with it. 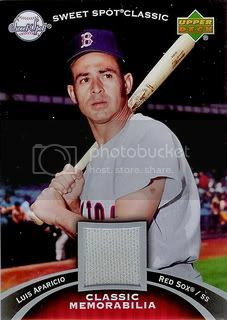 A nice card with a pic of Luis in a Red Sox uniform that I think I've seen before. Oh yah... it was here and here. 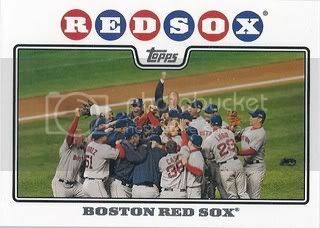 Here at My 2008 Topps Set Blog we enjoy all things 2008 Topps. Even though I find it a little odd that Topps has already started reprinting cards from just a few years ago, I'm glad to have "new" 2008 Topps cards to add to our collection. 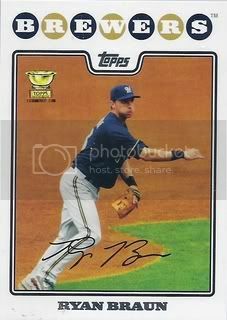 Plus I like Ryan Braun so this card is definitely a keeper. 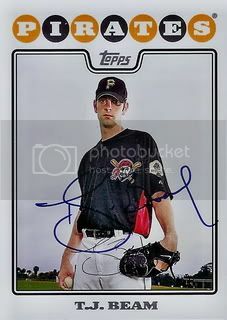 Maybe one day if I'm able to get all of Ryan's regular 2008 Topps cards signed ( I think he has at least 4 ) I'll think about going for this one too. After the ugly autograph I got from David DeJesus during Spring Training, I figured I'd pick up one of these certified autographs from the 2011 Topps Lineage set. This one set me back two George Washingtons. 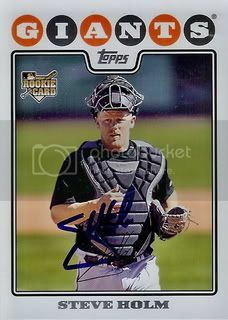 Here's another autograph I picked up for a few bucks from the 2011 Topps Lineage set. This one is of Diamondbacks starter, Daniel Hudson. Daniel's putting together a pretty good season out here in Arizona. The only thing that would make this card any better would be if he was in a D-Backs uniform. Topps hit a home run with their Topps Retired set in 2003. They brought it back the following two years but it has been extinct since 2005. 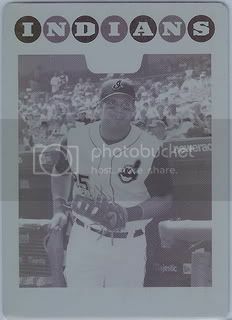 Recently it's kind of been replaced with Topps Lineage or the SP versions of old timers they insert into their base set. I really like this card. It features the classic 2004 Topps design with a unique picture of Lil Luis and a retro White Sox logo. Pretty awesome. Here's another card that our friend Raiderdan sent us. This one is of Tony Pena Jr. Thanks, Dan! There was a time when I thought former Diamondbacks prospect, Greg Smith was going to be a big deal. He put up some okay numbers with the A's in 2008 but has pretty much disappeared since. 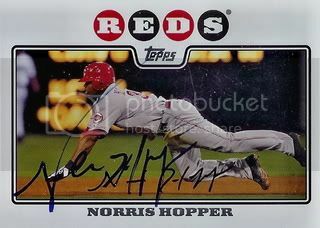 Yah we got Norris Hopper's autograph. Anyone actually remember this guy? I don't. Here's another one for the set. 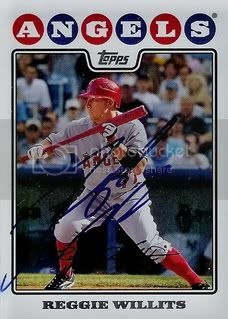 Los Angeles Angels outfielder, Reggie Willits signed his card from Series 2 of the 2008 Topps set. A ton of the autographs from the 2011 Topps Lineage set hit eBay soon after its release. Most of them are still going for pretty cheap. 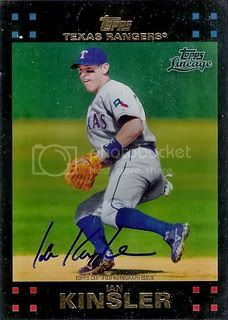 I picked up this 2007 Topps Reprint Auto of Ian Kinsler for a few bucks. I'm happy. 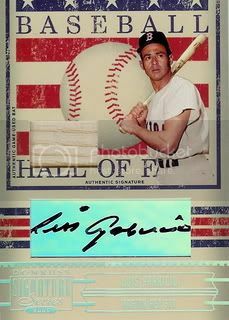 Another thing I liked about the 2011 Topps Lineage set was the over abundance of parallels. Yah I'm being a little sarcastic there. But honestly it's kind of nice to have four new Luis Aparicio cards to try to hunt down. So far I've got two down. I'm still looking for the Refractor and 1975 mini. This one's pretty cool. It's super sparkly. While I haven't purchased any packs of 2011 Topps Lineage myself, I have picked up a few singles and autographs from the set. The base cards have a nice, simple design. I don't hate it. The mix of old and new players on the checklist was a big plus in my book. 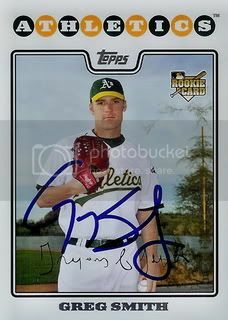 Former Yankees prospect, T.J. Beam signed a card for our set. T.J. is currently playing in the Atlantic League for the Lancaster Barnstormers. Our friend Raiderdan sent us another signed card for our set. This one is of former Giants catcher, Steve Holm. Here's another World Series Champion for our 08 Topps set. 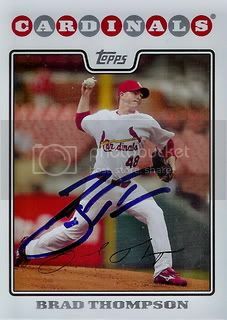 Former St. Louis Cardinals reliever, Brad Thompson signed a card for our set. Brad was with the Cardinals when they won the World Series in 2006. After a little break, we're back with more signed 2008 Topps cards. 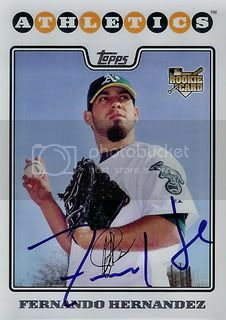 Fernando Hernandez made his MLB debut in 2008 with the Oakland A's. Unfortunately he hasn't been back since. 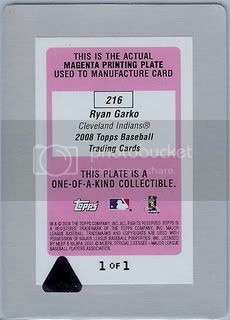 I remember that not too long ago my Dad pulled a Ryan Garko printing plate out of a pack he bought at our local card shop. This was before I decided to collect the 2008 Topps set and didn't think much of it. Every once and awhile I have thought about that card and how I haven't seen it in a long time. I remembered it being from the 2007 set not 2008. I was going through some of my Dad's things the other day and came accross the Garko plate. To my surprise, it was from 2008. Needless to say I was super stoked. 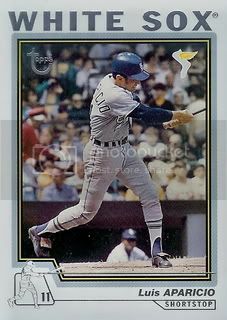 Finishing up Luis Aparicio week today with another card I had on my wish list for years. 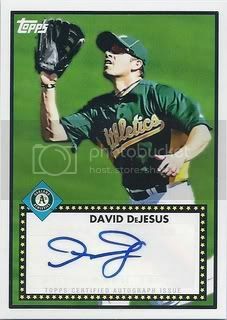 I've always liked the design Donruss used for their Signature Series autographs. I just thought it was really cool to put the Hall of Fame logo on the background on these cards. I've always wanted to own one and I finally broke down and picked this one up. This one's got a little extra too since it has a piece of Lil Luis's bat in addition to the signature. 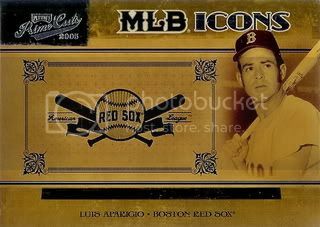 We picked up this Luis Aparicio jersey card a few years ago at a local card show. I think it only cost a buck or two. Such a good deal there was no way we could pass it up. I really like this design. It's simple and has a nice size jersey swatch.